When I got my first AR (No too long ago 2008), I went all mod crazy... And (as a newbie) I replaced a lot of the factory parts for aftermarket "upgrades"
On the first one, I replaced the pistol grip with a Magpul MIAD, then switched to the LaRue A-PEG grip... 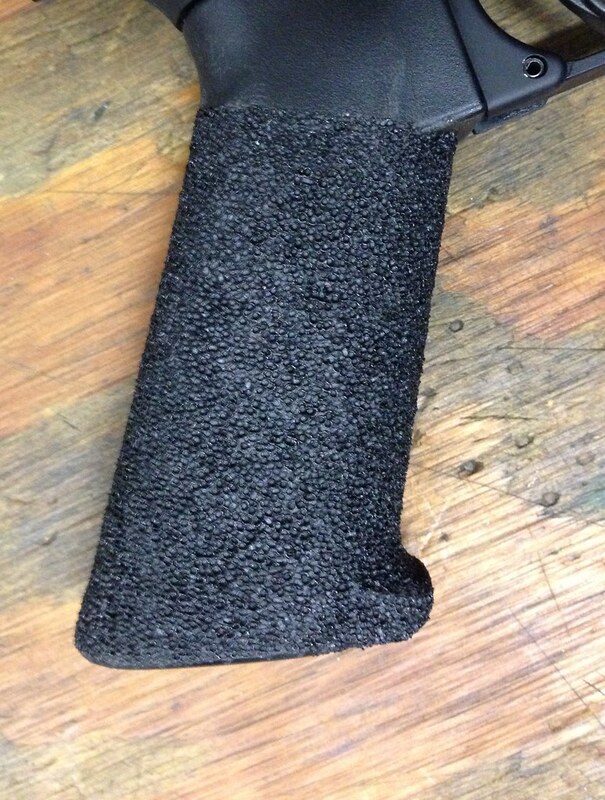 The LaRue grip has been the go-to grip ever since... That is, until the other day! 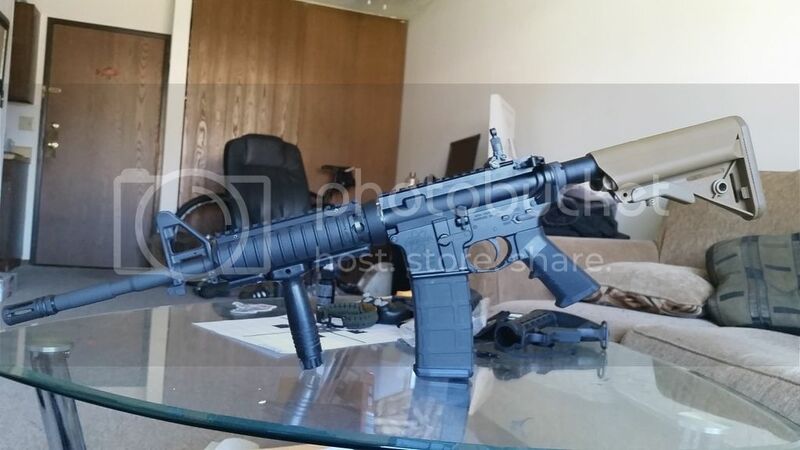 I'm putting together an M4A1 SOPMOD Block 1.5/Phased Replacement "Clone"... So for a pic, I took the A-PEG grip off, and slapped an A2 grip on the lower, and I'll be damned... Sonofabitch just feels right!!! To think that I'd get annoyed whenever I'd get a LPK, and the first thing I'd do was chuck the A2 grip in my gun parts drawer... I think I have about 12 of them! Guess I gotta build 12 more rifles now! There's no part of the AR I hate more than the A2 grip and that stupid nub. I might finish stippling it, and install it to see how it feels! Ugh, no. I had the A2 grip on mine for a while, and it always hurt after a while of carrying it in the woods. I use hogue overmolded on my guns now. The a2 pistol grip is a horrible angle. My wrist starts to hurt when carrying it at the low ready. One of those parts that the aftermarket is vastly superior. OP, I have about forty A2 grips I'll sell you for a dollar each. Barrel needs more free float. You don't have a sling? I don't even bother changing the factory grips anymore. My preference is for the Tangodown BG16, but I prefer to spend the money on ammo anymore. A1 grip > A2 grip. I don't mind the A2 grip, but I don't care for the numb and its a bit too small for my hands. I prefer a MIAD or MOE grip on my rifles. I'm an MOE+ kinda guy myself, but I didn't really mind the A2 that came on my M&P Sport. 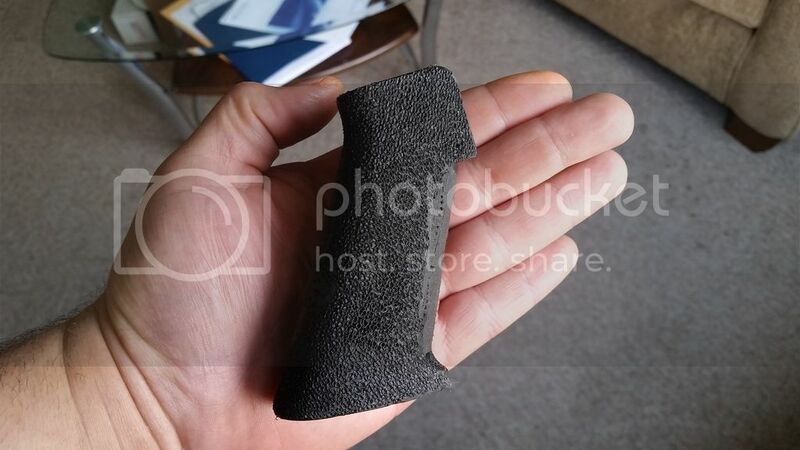 However I prefer rubberized grips vs. their plain plastic counterparts. At the time, no, but with the hogue I can carry with or without a sling with no discomfort. This. I always swapped mine out for an A1 grip. The MIAD is good, but mine look like A1 grips. I don't like the longer back piece on the MIAD. I REALLY hate the new "gunfighter" style grips, the grip angle is weird after years of carrying A1 grips. I've always liked the A2 grip the most, even compared to the Magpul, Hogue, etc. If serious, I'll buy half! As for the original waffle stock, I got one of those as a gift recently and I have been using it on my primary AR for the past couple of weeks. Its nicer than I remembered but since it doesn't have a provision for QD sling swivels it will be going in a parts box as soon as I get a decent replacement. I am thinking an MFI minimalist. I have A2 grips on all my ARs, except one. It works fine for me and I've never seen a need to replace them. The little nub helps give you leverage with one hand. And while I'm at it, M-16A1 > M-16A2. I've got guns with MOE, and A2, and actually prefer the A2. I'm perfectly fine with the A2 grip, too. It's one thing I just haven't felt compelled to change. IMHO the a2 grip only works well with people who have short fingers because it doesn't place the proper part of their finger on the trigger without them contorting their hand. It also lacks any sort of thumb rest. You appear to have normal fingers so my guess is either you don't know how to properly pull a trigger or you enjoy the discomfort of contorting your hand. I hate them with a passion. Give me an Ergo grip or give me death! Hogue grip is best value out there. I can't speak about its strength or durability, but I've shot pdogs for days with it and like it a lot. MIAD with large backstrap. Thanks. a2 grip goes straight in the trash. Or you could just buy another grip? 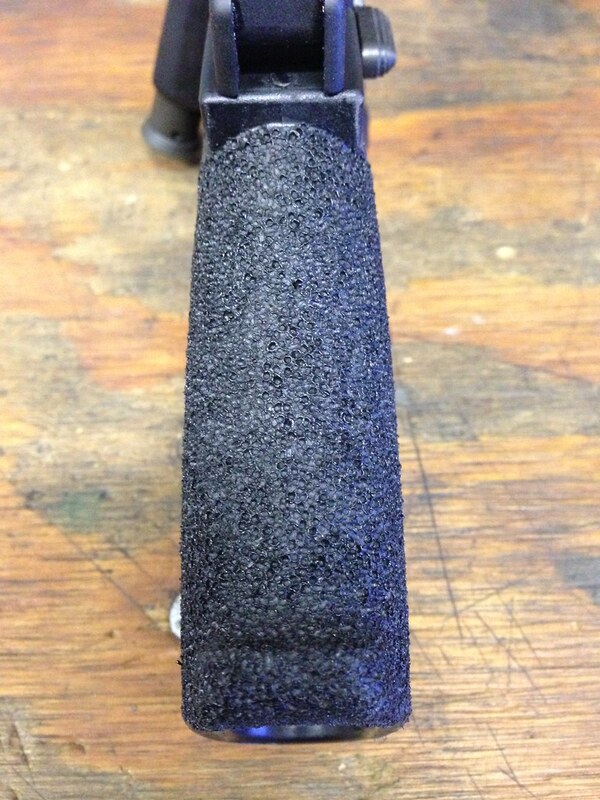 Between storage of rifle parts, to better angles, to better grip/feel.....this is something I always "fix." From my wrist to the the tip of my trigger finger is 7 and 3/4 inches... Not NBA baller material, but I've go some paws on me. Theres no discomfort, and I've never had an issue with trigger play with an AR rifle in my life! I just have a new found appreciation in weapon manipulation and maneuverability with that overlooked A2 grip!!! Amen. I won't even toss them into the parts box. They get flung into the recycling bin. I have no issue with the A2 grip. I have one on an AR and on my SCAR... the SCAR A2 feels slightly better than the AR A2, but look identical dimension wise. Maybe just the position of the grip. I only have a MIAD Gen2 on my Mega Maten and a MOE on a pink furniture AR. I plan to replace the Maten grip with an A-PEG though, smooth or rough though? Used them most of my time in the Army, they are fine. I cut the nub off of one as a substitute for an A1 and it feels pretty good. The only after market grip I like is the plain MOE. I just give them to my dog, they make outstanding chew toys...last a long time with a dog that normaly destroys stuff. OP, carry one for a decade or so and let us know how you feel about it. What's the point of the nub anyway? Dank memes foil clutch schemes. I haven't seen a real A2 grip in this thread yet either. The Colt ones are different than the after market. They have a larger swell to them, and the material is stronger, not that I use them. I like a more vertical angle because the traditional ones crank my wrist pretty bad. There's a former USMC officer who is a member here that was part of the team that developed the M16A2. He has responded extensively in threads asking that question in the retro forum and A2 forums on the site. There's a lot of info here and people you normally would never get under the same roof. His name is coldblue IIRC.